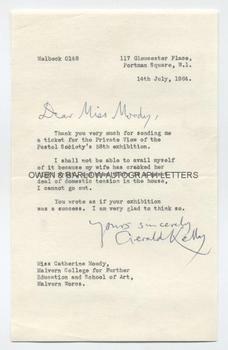 SIR GERALD KELLY Typed Letter Signed. British (English) painter best known for his portraits. TLS. 1p. 117 Goloucester Place, Portman Square, W.1. 14th July 1964. To Catherine Moody. "Thank you very much for sending me a ticket to the Private View of the Pastel Society's 58th Exhibition. I shall not be able to avail myself of it because my wife has cracked her right wrist, and when there is a great deal of domestic tension in the house, I cannot go out. You wrote as if your exhibition was a success. I am very glad to think so". With fine autograph signature. From the studio archive of the Malvern artists Victor Hume Moody and his daughter, Catherine Moody.